Purchase for $199 Get our PowerPoint plugin for FREE for a limited time. 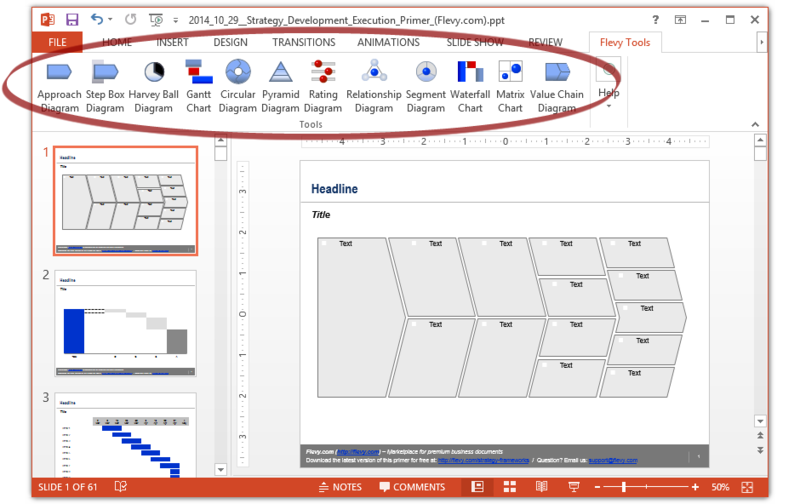 Download Flevy Tools Flevy Tools is a powerful PowerPoint plugin for creating common business diagrams, from Gantt Charts to Value Chains to Waterfall Charts. "Flevy Tools is a must-have for any consultant or anyone who deals constantly with business presentations. I've used many similar tools in the past and Flevy Tools is the one I find myself using most often." "I can honestly say this set of diagramming tools from Flevy has reduced the time it takes me to create PowerPoint decks by over 50%. This is a life saver. I have shared it with all my colleagues and friends." As of March 2015, Flevy Tools has been downloaded over 25,000+ times by PowerPoint users from around the world. We are offering Flevy Tools to you as a complimentary product, as an introduction to our young organization, Flevy. This is a limited time offer. We have previously sold Flevy Tools for $199. If you find value in Flevy Tools and wish to pay the full price, you can do so here. You can also support us by telling others about Flevy Tools! If you are using PowerPoint 2007 and later, a new tab titled "Flevy Tools" will be added to your PowerPoint ribbon on the far right (see screenshot above). If you are using PowerPoint 2003, a dropdown menu will appear instead (see last screenshot). The current version (v3) support 12 different types of common business diagrams. Flevy Tools v3 is currently only available for Microsoft PowerPoint 2007 and later (both Windows and Mac).